These days we are all much more conscious of re-using, re-cycling and up-cycling items around the home. Whether it’s an environmental concern, an economic one or both, just because furniture might be looking or smelling a bit old, it’s worth giving it a make-over before immediately replacing it. When it comes to expensive purchases like sofas and armchairs, when they are new we take great care of them. Over time we take them for granted and might not be so quick to pick up crumbs or worry about the odd spill. However, if you’ve suddenly grown conscious of the fact that the kids have eaten too many snacks on the sofa or the pet has had one too many snoozes on the armchair, then you need a professional upholstery cleaner. It will come as a genuine surprise when you see how good your furniture looks after a proper professional clean. Any stains and marks will be removed, colours will look brighter and the freshness will remind you of when your beloved furniture was brand new. Keeping up a routine of regular cleaning will prolong the lifespan of the furniture and leave the colours looking as good as they did when you bought them. If you’re worried about fabric appearing to thin out or look dull, it could be dust particles that are to blame. Over time, dust particles can damage the fibres in your upholstery, but a thorough clean will eliminate the gathering dust making your furniture stronger and last longer. Fabric acts as an absorber and unfortunately this includes odours. 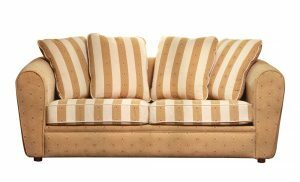 If your sofa is suffering from a rather unpleasant or musty aroma, it could be the result of all those people, pets, food and shoes that all left their mark. A professional upholstery clean also includes deodorising and freshening up the fabric, leaving nothing but pleasant smells. By removing odours and a build-up of dust particles, your home is becoming cleaner, fresher and healthier. The vacuuming and cleaning process applied to upholstery will eliminate allergens such as pet dander, dust mites and soil which can all cause allergies and breathing problems for many people. After a thorough professional clean, you’ll receive helpful advice about how to maintain and look after your refreshed furniture. Treat yourself to a living area you feel proud of without having to worry about what visitors might think when they sit down on a grubby sofa. Improve the air quality inside your home and breathe new life into old furniture to make you fall in love with your décor all over again.